This chapter provides concluding comments and reflections on the Chain Reaction project as well as inquiry approaches in general. The authors also include three reflective stories based on their involvement in the program. These stories attempt to bring differing roles and aspects of the project to life while identifying successes and barriers within the project. They also discuss implications for the future of science education across Europe and summarize their outcomes from the Chain Reaction project. Our belief that inquiry approaches can add significant value to students' learning experiences in the science classroom strongly influenced the design of the Chain Reaction project and this belief has deep roots over many years of experience and scholarship in the field of science education. Historically, the idea of inquiry dates back to the time of Greek philosophers (Shields, 2014), with a more recent attempt to encourage science learning through inquiry originating with Dewey (1938). Since this point, the roots of scientific inquiry have been fertilised over the years by the work of scholars such as Herron (1971), Driver (1986; 1994), Osborne (1998), Harwood (2004), Bybee (2006a) and Crawford (2000). Our belief in inquiry is underpinned by a desire to support an approach that situates the student as an agent within the inquiry process and provides greater opportunities for encouraging a more positive attitude to the study of science and personal growth by encouraging student ownership of their own learning. We are not alone in this, indeed, the effectiveness of inquiry in science teaching and learning is supported by a large pool of scholars whose empirical work reports positive learning outcomes for students in terms of achievement, enthusiasm, ownership and scientific skills development (Minner, Levy, & Century, 2010; Minstrell & van Zee, 2000) as they practice science which mirrors, to some extent, authentic processes outside of the classroom. 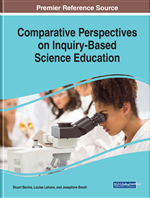 This work signifies continuing attention on inquiry teaching in science education and suggests a perceived importance placed on inquiry by a good portion of the science education community which we will now reflect upon. The following section will explore literature which expresses specific positive outcomes from engaging in the practice of inquiry.